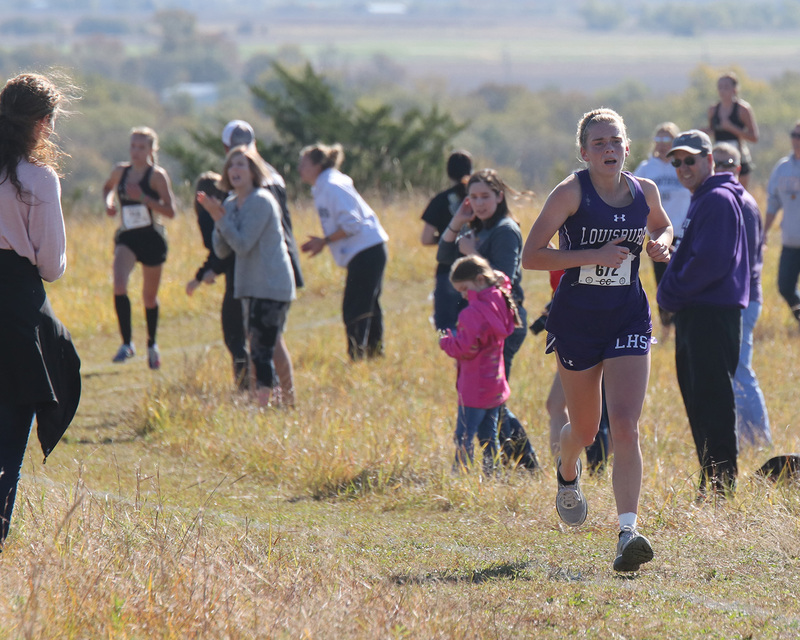 Louisburg junior Trinity Moore makes her way toward the finish line Saturday during the Class 4A Kansas State Cross Country Championships at Wamego Country Club. Moore finished fourth in the state and teammate Reese Johnson was sixth. WAMEGO – It was going to be hard for the Louisburg High School girls cross country team to duplicate its magical season of 2017. Not only did the Lady Cats qualify their team for state for the first time in program history, but they also had a top five finisher in Trinity Moore. 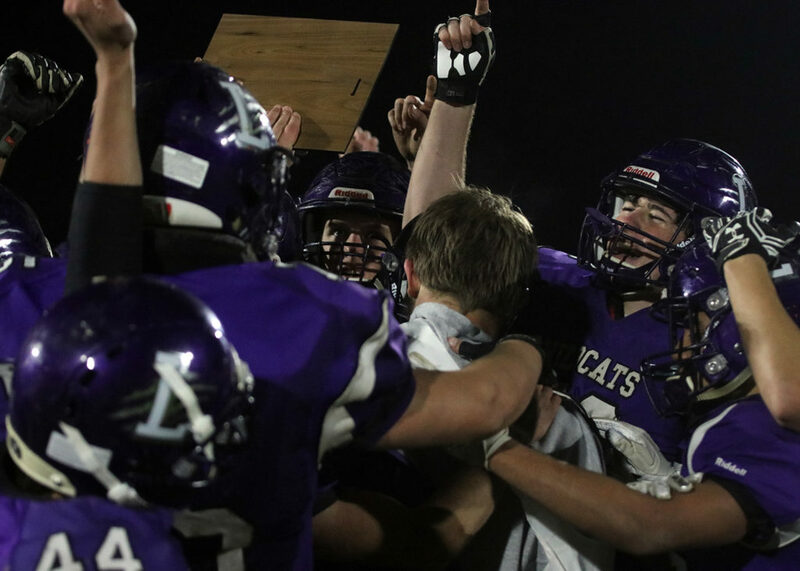 Fast forward to 2018, Louisburg wasn’t able to match that successful run – the Lady Cats took it a step further. 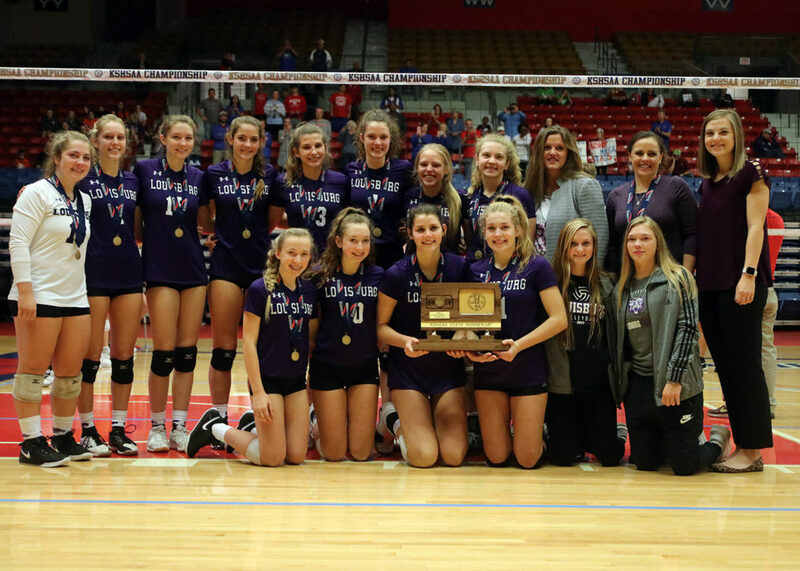 Baldwin won the state title with 51 points and Eudora was runner-up with 81. Buhler was third at 107 and Bishop Miege was fourth with 128 points. 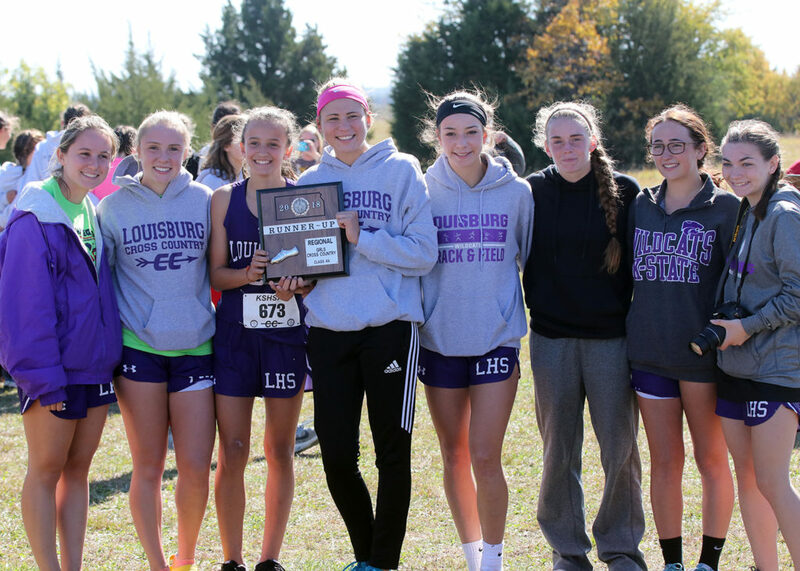 The Louisburg girls cross country team took fifth at state on Saturday. Standing (from left) are head coach John Reece, Shaylor Whitham, Kaitlyn Lewer, Kennady Wilkerson, Trinity Moore, Delaney Wright, Carlee Gassman, Reese Johnson and assistant coach Arianne Seidl. Moore, who finished fifth at state a year ago, bested her performance by one place as she took fourth with one of her better performances of the season. Johnson was right behind her as she crossed the finish line in sixth to earn a state medal as a freshman. “Coach A (Arianne Seidl) and I were elated with the girls efforts and for Trinity and Reese to both be top 10 was amazing,” Reece said. “I felt they would both medal, but did not see them finishing as well as they did. We are starting to develop an expectation of high performance, not a hope. 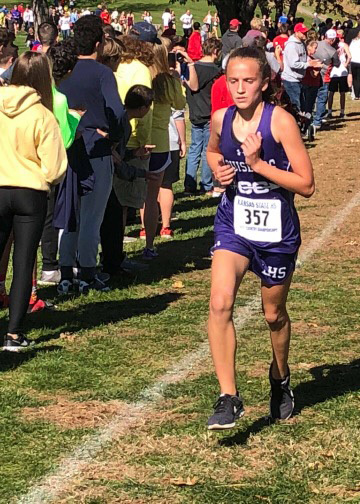 Moore ran strong in the 96-runner field as she ran a time of 20 minutes and 15 seconds and her fourth place finish is now the highest state cross country finish in school history. 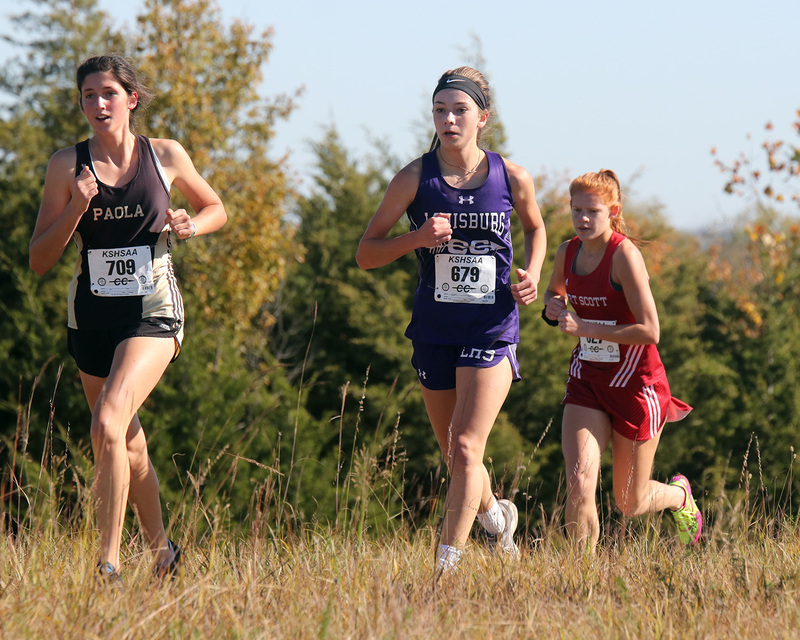 Chapman sophomore Taylor Briggs won the individual state title in 18:57 and Bishop Miege senior Fallon Russsell was second in 19:43. Eudora’s Riley Hiebert was third at 20:03. “Overall, I think I ran pretty well,” Moore said. “The race felt like it went by really fast. I was able to push through the hills and then surge going out of them. Placing one spot higher makes me feel like I have worked harder, and overall had a better season than last year. I know I have gotten better and had my teammates there to push me all year, so it feels great. Freshman Reese Johnson runs down a straightaway Saturday at Wamego. As for Johnson, she didn’t perform like it was her first state meet. She finished just a few seconds behind Moore to take sixth overall in 20:20. Johnson went stride for stride with Abilene’s Sydney Burton toward the finish line, but Burton just edged Johnson for fifth in a photo finish. “I was overly excited to finish sixth,” Johnson said. “I was expecting good results, but not that good. I was really proud of myself and my team. As a freshman, I am just so happy to have done so well. To get that fifth place finish, the Lady Cats were going to have to other runners step up and they were able to do that. Junior Carlee Gassman was third on the team and took 34th overall in 22:01. Senior Shaylor Whitham (24:13) and freshman Delaney Wright (24:19) were 78th and 79th, respectively. Senior Kaitlyn Lewer (25:03) was 85th and sophomore Kennady Wilkerson (27:57) was 96th. It was a great way for Whitham and Lewer to end their Wildcat running careers, according to coach Reese. “Our seniors this year were awesome,” Reese said. “The three years that I coached Shaylor and Kaitlyn were wonderful. They brought great leadership to the team and showed it during practice and races. I was so happy for them to end their cross country careers at the pinnacle of the season by running at the state meet. They will be greatly missed. 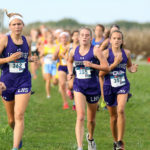 The Lady Cats are already looking forward to next season as they will return five of the top seven runners from this year’s team as they try for an even bigger finish at state. 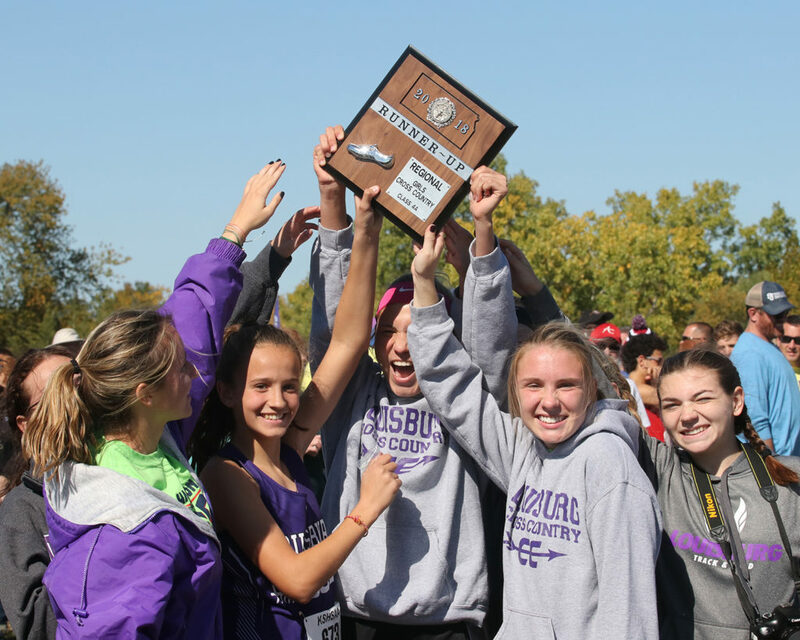 Members of the Louisburg girls cross country team hoists their regional runner-up trophy following last Saturday Class 4A regional in Ottawa. The Lady Cats qualified for state for the second consecutive season. 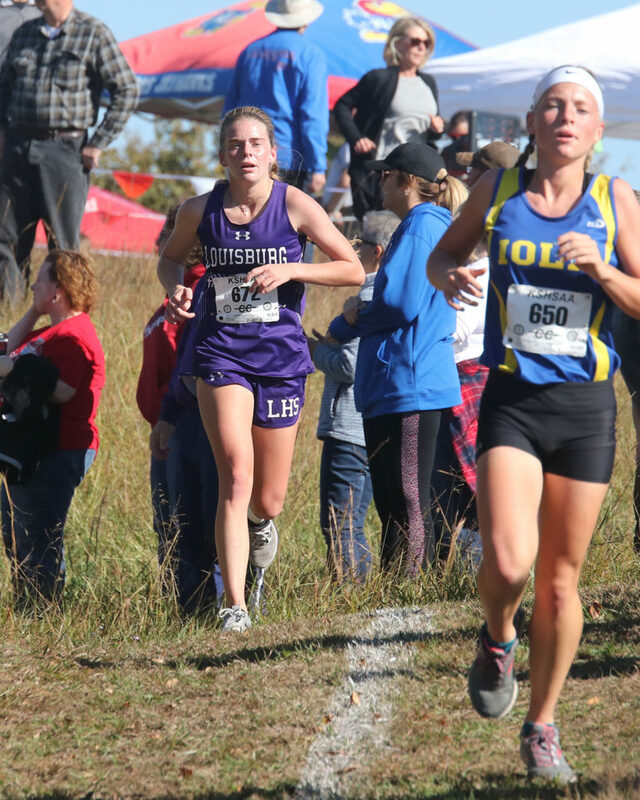 OTTAWA – As runner after runner crossed the finish line during the Class 4A regional meet in Ottawa, doubt began to creep in the minds of the Louisburg High School girls cross country team. 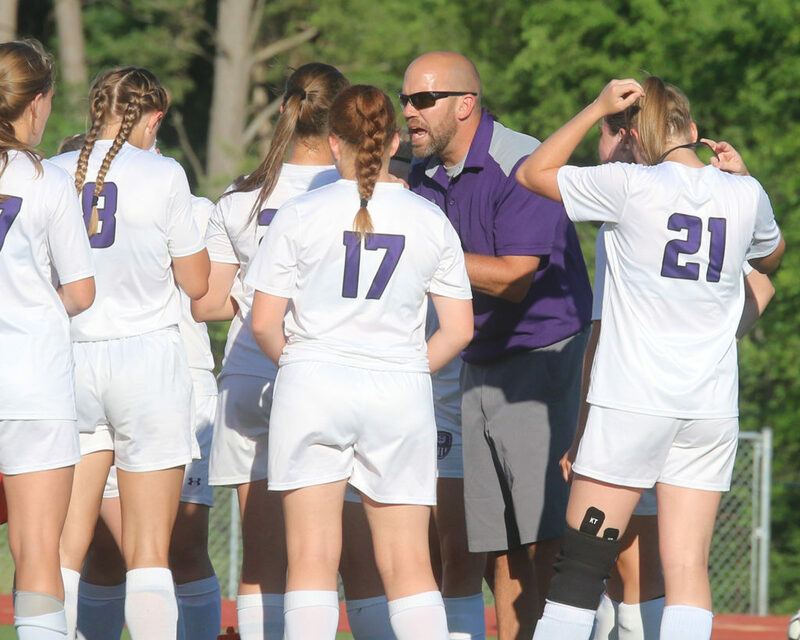 The Lady Cats were hoping to finish in the top three of the team standings and earn a state berth for the second straight season. 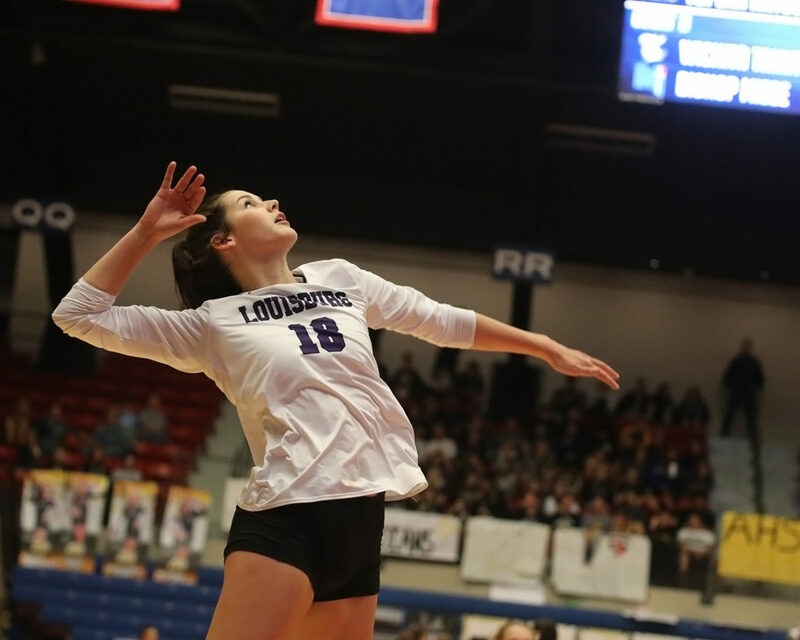 Louisburg wasn’t sure if the results were going to be good enough to equal last year’s third place regional finish. It turned out the Lady Cats had nothing to worry about. Not only did Louisburg finish in the top three, but the Lady Cats recorded the best finish in school history as they took second with 75 points at the Eisenhower Road Course, 10 points ahead of third-place Paola. Baldwin won the girls regional with 40 points. Moore, Reese Johnson, Carlee Gassman, Shaylor Whitham, Delaney Wright, Kaitlyn Lewer and Emily Williams will all be making the trip to Wamego this Saturday for the Class 4A state meet. 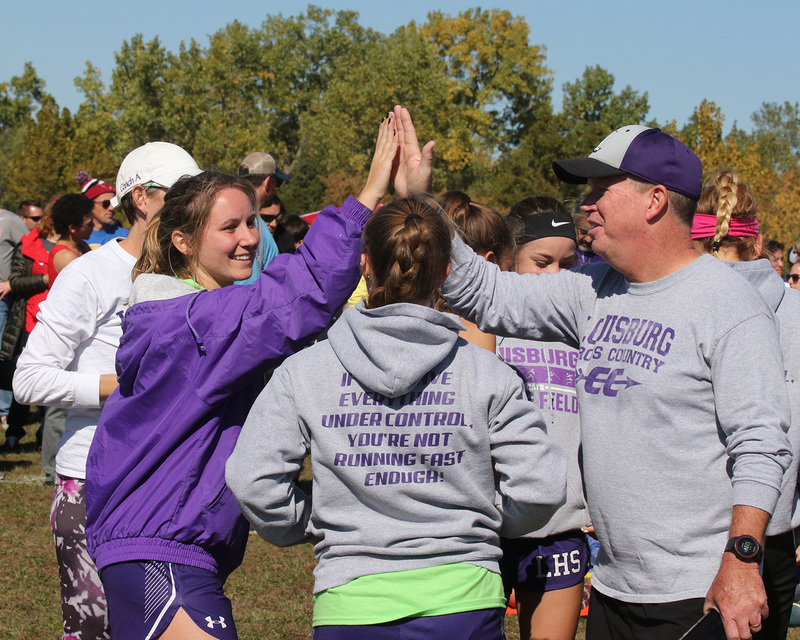 Louisburg runners and coaches celebrate the announcement of their regional runner-up finish. Along with the Lady Cats’ regional runner-up finish, they also had two runners finish in the top three individually. Johnson passed Moore late in the race to finish second overall in 22 minutes and 8 seconds, and was five seconds in front of Moore, who ran a 22:13 to come in third. It was the first time this season that Johnson, a freshman, eclipsed her teammate in a race as both runners have been pushing each other in practice. Louisburg freshman Reese Johnson leads a pack of runners up a hill Saturday in Ottawa. “I was not expecting it at all,” Johnson said of her second place finish. “Everyone was telling me I could beat Trinity and I was able to do it. To me, this was my favorite course so far, even though everyone else hated it. I loved it. I just controlled myself in the middle and took it up the hill. Although the finish might have surprised Johnson, it didn’t surprise her coach as he has seen her progress all season. Junior Trinity Moore gets ready to take on one of the many hills at the Ottawa course. As good as Johnson and Moore ran for the Lady Cats, it was the middle three runners that helped secure the Lady Cats’ state bid. 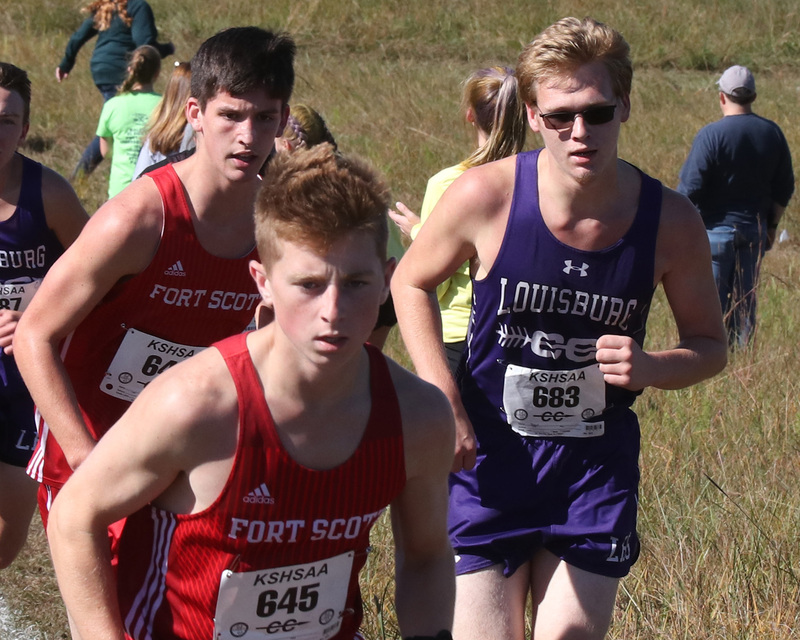 Gassman was third on the Louisburg team with a 15th place finish in 23:47, while Whitham finished 25th in 24:49. Wright took 31st overall in 25:36. Lewer (26:34) and Williams (27:52) took 36th and 40th, respectively. “It was amazing,” coach Reece said. “I really had no clue that we would get second. For a long time I thought we were fighting for third. Our three, four and five runners were really huge for us. 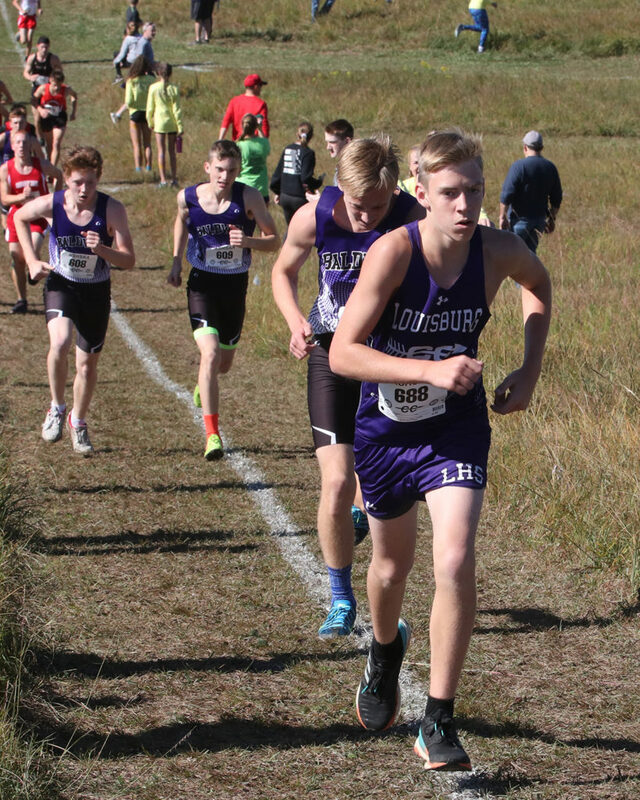 The Louisburg boys saw its season come to an end Saturday in Ottawa as the Wildcats took seventh with 163 points. Iola won the regional with 49 points, El Dorado was second with 51 and Fort Scott was fourth with 84. Junior Anthony Davis led the Louisburg boys with his 27th place finish. Junior Anthony Davis was the highest finisher for Louisburg as he took 27th in 20:31. Sophomore Cade Holtzen was 29th in 20:39 and junior Evan Murphy took 32nd in 20:49. Sophomore Carson Houchen (21:26) and freshman Ben McKain (21:39) took 37th and 38th, respectively. Seniors Gareth Baus (22:03) and Jackson Staab (24:28) took 42nd and 54th. 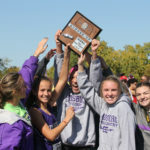 As for the Lady Cats, they hope to put together their best performance of the season Saturday during the Class 4A state meet at the Wamego Country Club. 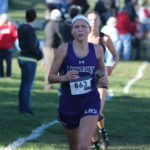 The 4A girls race is scheduled to run at 12:55 p.m.
After running as a team at state last season, and Moore finishing fifth overall to earn her second state medal, Louisburg is hoping for even bigger things this time around and a few less nerves. 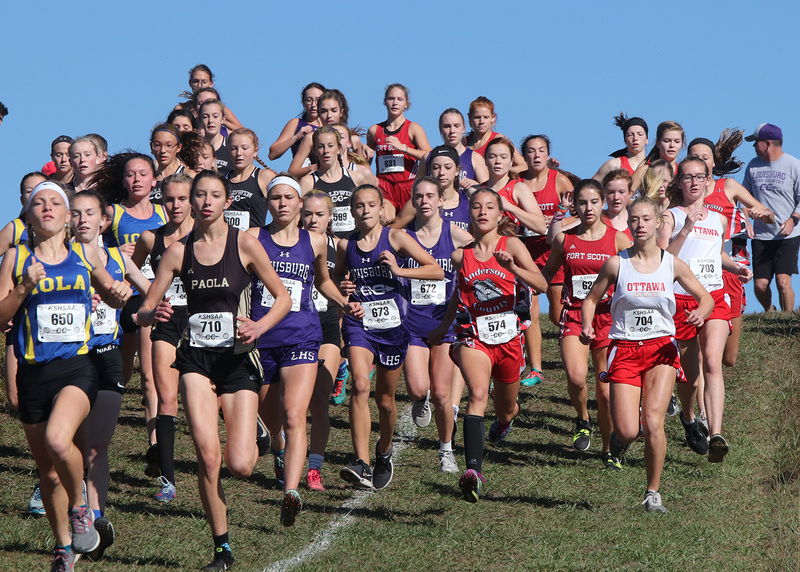 For a photo gallery from the regional meet, make sure to click here. 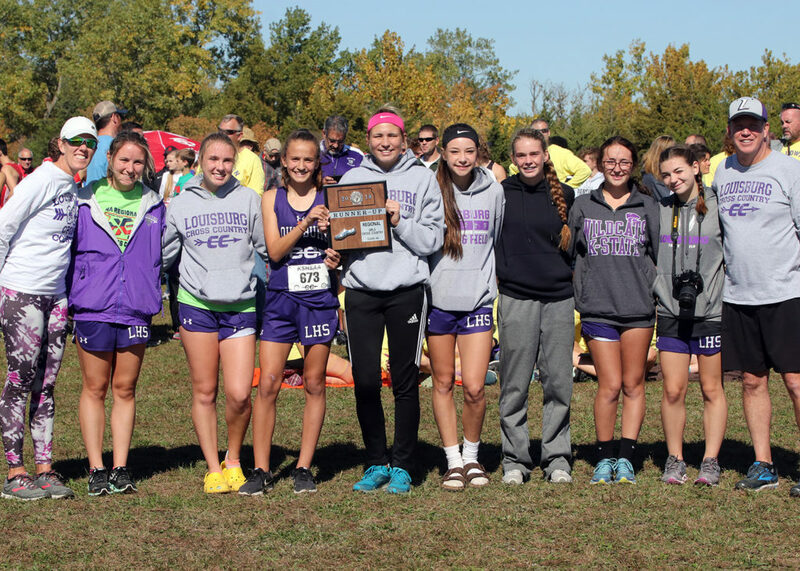 Members of the Louisburg girls cross country team (from left) are Kaitlyn Lewer, Shaylor Whitham, Reese Johnson, Trinity Moore, Delaney Wright, Carlee Gassman, Emily Williams and alternate Kennady Wilkerson pose with the Class 4A regional runner-up plaque Saturday in Ottawa. 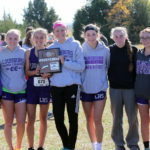 The Louisburg High School girls cross country team is headed back to the Class 4A state meet this weekend in Wamego. The Lady Cats finished second at the regional meet in Ottawa last Saturday and qualified the entire team for state. 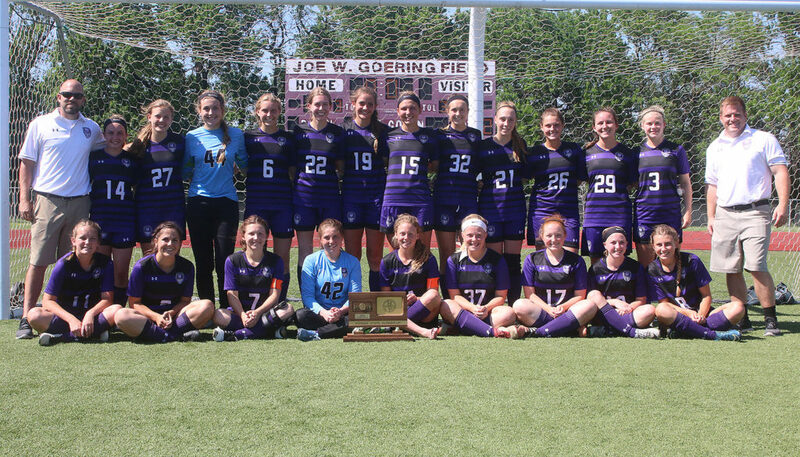 Trinity Moore, Reese Johnson, Carlee Gassman, Shaylor Whitham, Delaney Wright, Kaitlyn Lewer and Emily Williams led the Lady Cats to their first ever regional runner-up trophy. 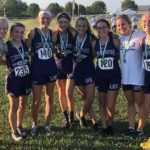 Louisburg also added a pair of individual medalists as Johnson finished second overall and Moore was third on what was a difficult, hilly Ottawa course. Here is a photo gallery from Saturday’s meet, which also included the Wildcat boys’ final race of the season. The Lady Cats are scheduled to run at 12:55 p.m. this Saturday at the Wamego Country Club. Congrats again to all the runners! 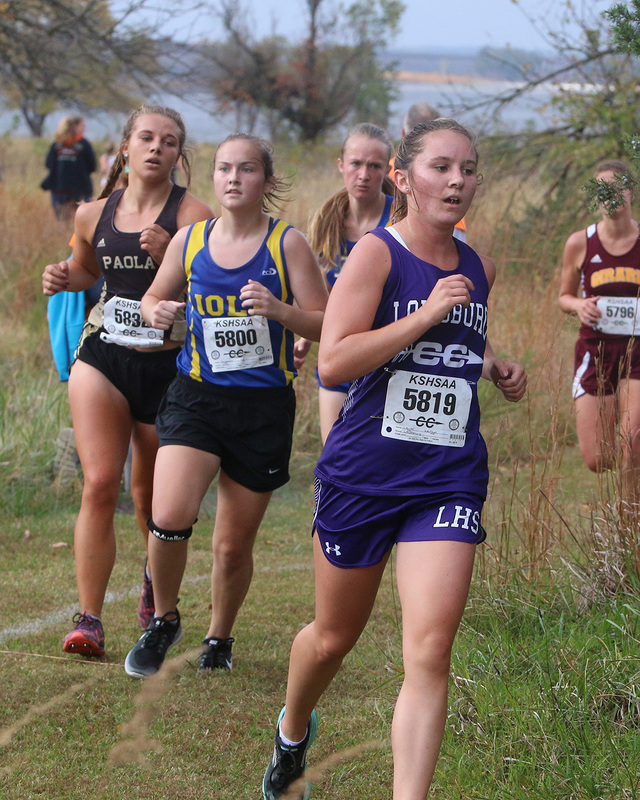 Louisburg junior Trinity Moore gets off to a good start last Thursday during the Frontier League Invitational in Baldwin City. Moore finished third overall and earned first team all-league honors. 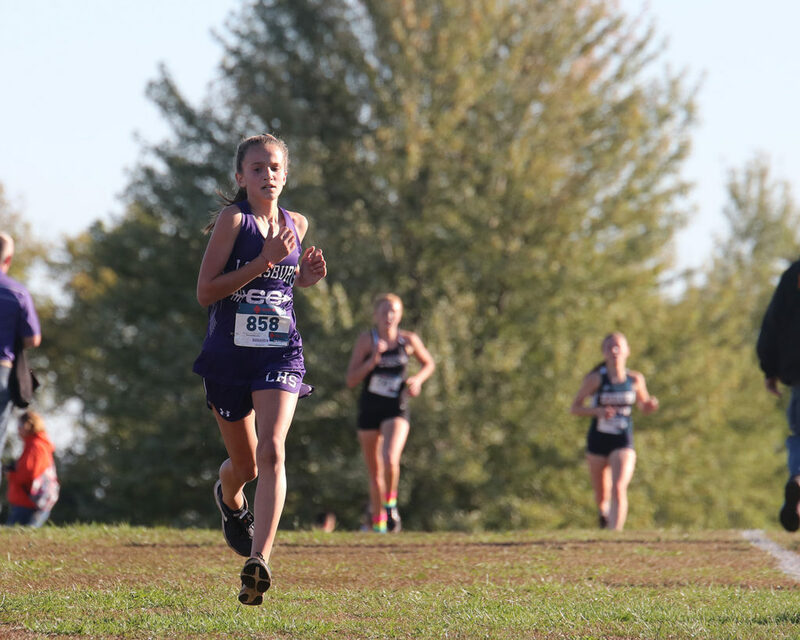 BALDWIN CITY – The Louisburg High School girls cross country team made history a season ago when Trinity Moore became the first Wildcat runner to win a Frontier League title. Now back at the same course a year later, the Lady Cats once again made a name for themselves. 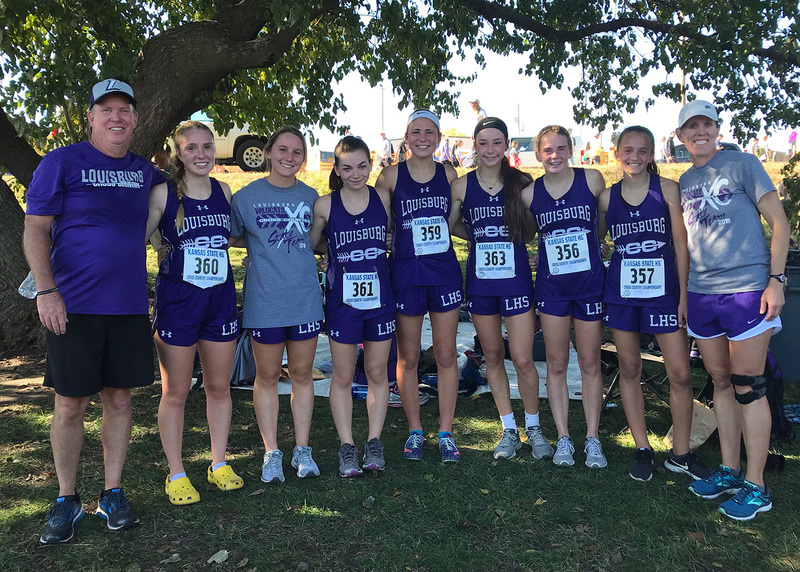 For the first time in school history, the Louisburg girls had two runners finish in the top five of the Frontier League Invitational. Moore, a junior, finished third and freshman Reese Johnson was fifth last Thursday at the Baldwin City Golf Course. Both runners earned first team all-league honors with their performance and sit among the best in what is a talented Frontier League field. Moore, who finished atop the Frontier League last season, eclipsed her time from a year ago to finish third in 19 minutes and 57 seconds. 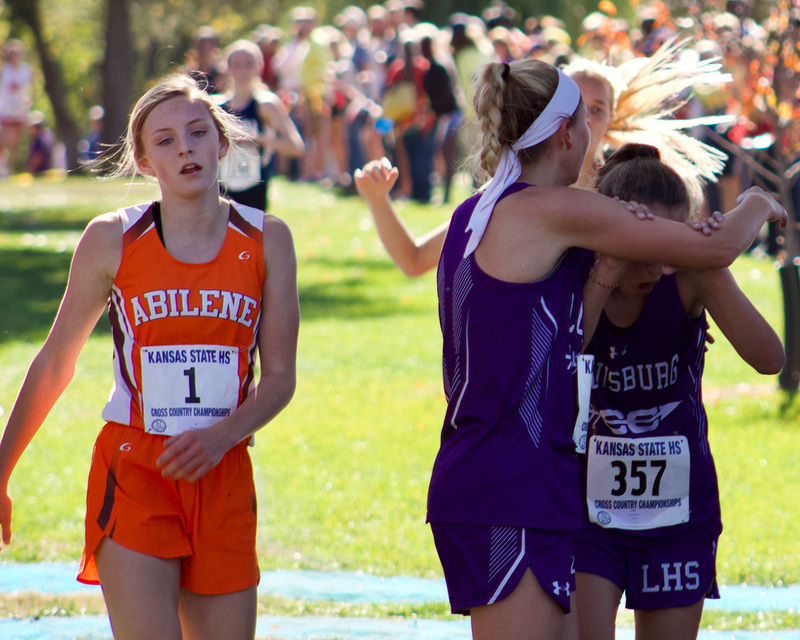 Moore battled Paola’s Darian Hudgeons most of the race, but came up just short as Hudgeons took second in 19:54. Eudora’s Riley Hiebert won the girls race in 19:31, but Moore competed hard despite being out of practice with a foot injury in the days leading up to the race. Freshman Reese Johnson heads toward the finish line last Thursday in Baldwin. Johnson took fifth overall and earned first team all-league honors in the process. In her first varsity season, Johnson has run her way toward the top of the Frontier League. She finished fifth in 20:17 and started near the front of the pack from the beginning and didn’t let up. As for the rest of the Lady Cats, Louisburg finished fifth in the team standings with 106 points. Baldwin won the league crown with 37 points and Eudora was second with 63. 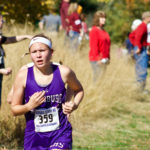 Junior Carlee Gassman finished third on the Louisburg team and was 35th overall in 22:29. Senior Shaylor Whitham (22:53) and freshman Delaney Wright (22:55) took 39th and 40th, respectively. Junior Emily Williams was 68th in 25:17. 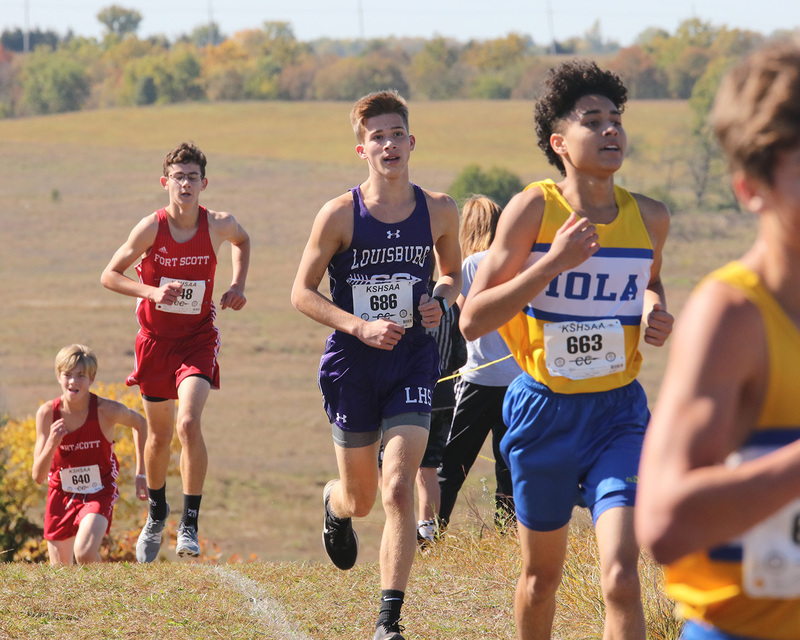 On the boys side, junior Anthony Davis led Louisburg in 32nd to finish in 19:18 and sophomore Cade Holtzen was right behind him with a time of 19:19 and took 33rd. Junior Evan Murphy came in 39th in 19:38 to finish third on the Wildcat team. Sophomore Carson Houchen (20:07) and freshman Ben McKain (20:09) took 51st and 52, respectively. 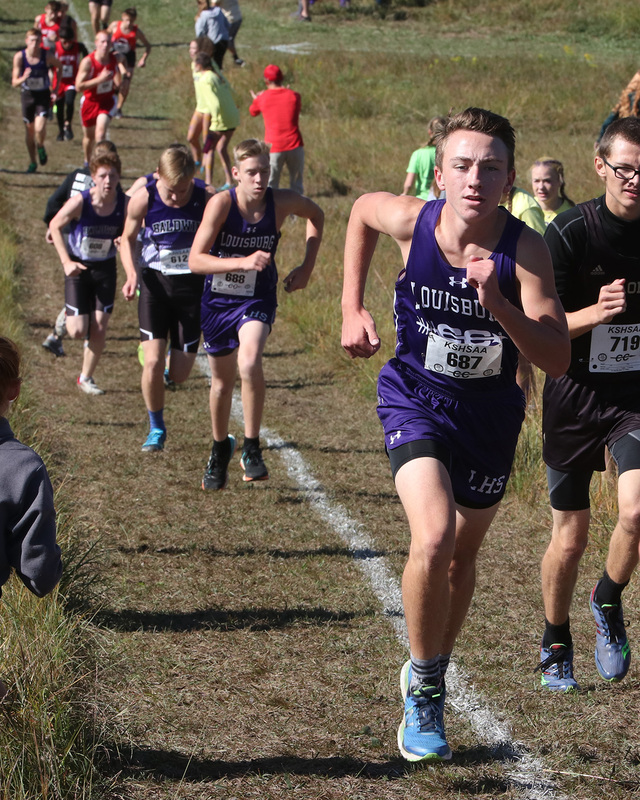 Louisburg sophomore Carson Houchen leads a pack of runners last Thursday during the league meet. Senior Gareth Baus took 67th overall in 20:59, while sophomore Tyler Detherage (21:33) and senior Jackson Staab (22:33) finished 79th and 87th. The junior varsity runners ran in a combined race with the varsity and freshman Malee Rutherford was the top Louisburg girls JV finisher as she took 65th in 25 minutes. 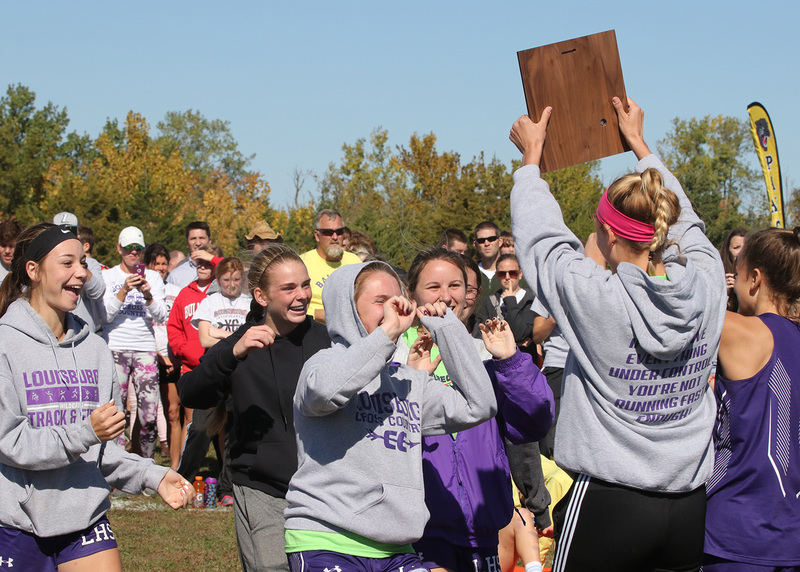 Louisburg will now prep for what will be the final race of the season for some. The Wildcats will compete in the Class 4A regional race in Ottawa, which begins at 11 a.m., on Saturday at the Eisenhower Road Course. The course features several steep hills and provides several challenges for the runners. The Lady Cats will try to qualify for state as a team for the second straight season after finishing third at regionals a year ago. 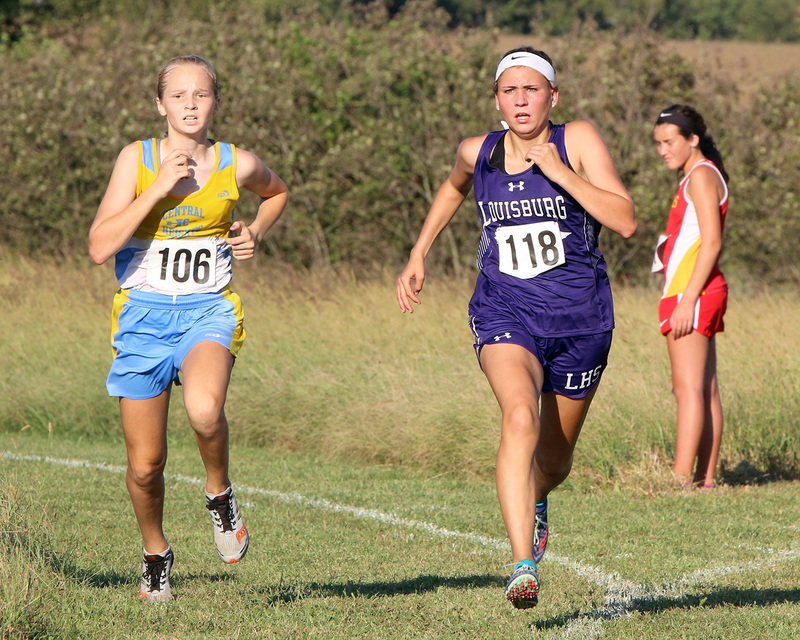 Louisburg freshman Reese Johnson (right) gets off to a good start Thursday during the Louisburg Invitational, while teammate Carlee Gassman was right behind her at Lewis-Young Park. 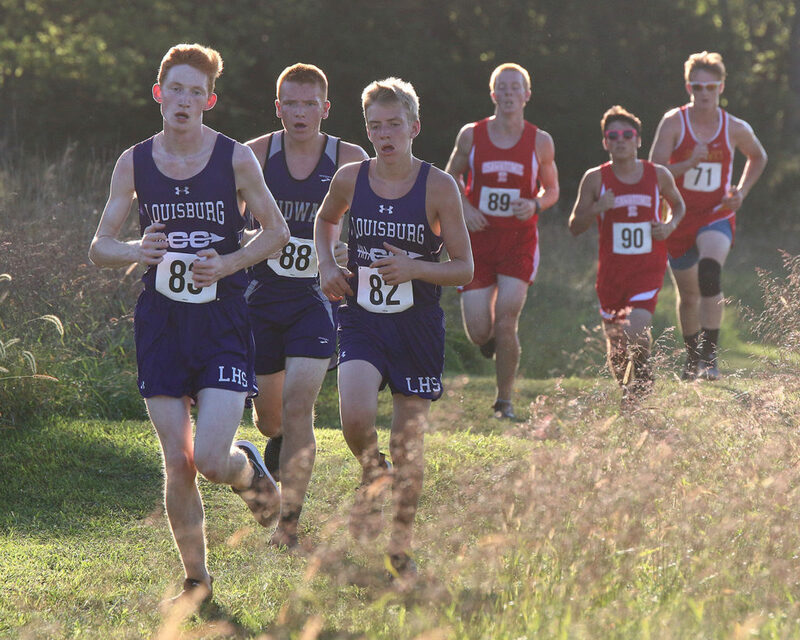 The Louisburg High School cross country team put its best foot forward Thursday during its home meet – literally. 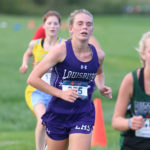 Several Wildcats ran personal best times as they racked up five medals in the Louisburg Invitational and the runners had a chance to shine on their home course at Lewis-Young Park. 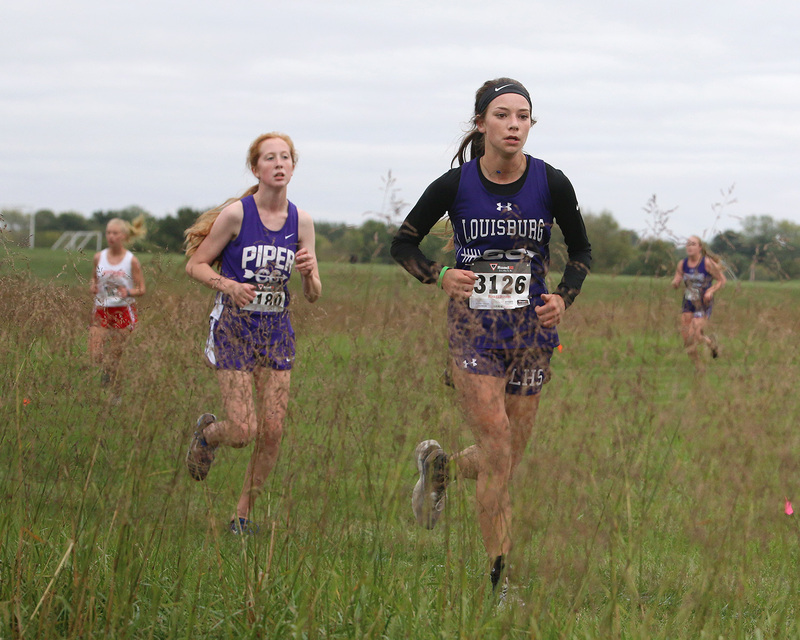 As a team, the Louisburg girls took full advantage of running on a familiar course as the Lady Cats finished second in the team standings with 55 points. Junior Trinity Moore, freshman Reese Johnson, junior Carlee Gassman, freshman Delaney Wright, senior Shaylor Whitham and senior Kaitlyn Lewer earned team medals for the fourth time this season. Individually, Moore, Johnson and Gassman earned medals for the Lady Cats, while juniors Anthony Davis and Evan Murphy snagged medals on the boys side. Moore had the best run of her career, time-wise, as she broke her own school record with a time of 19 minutes and 46 seconds to finish second overall. 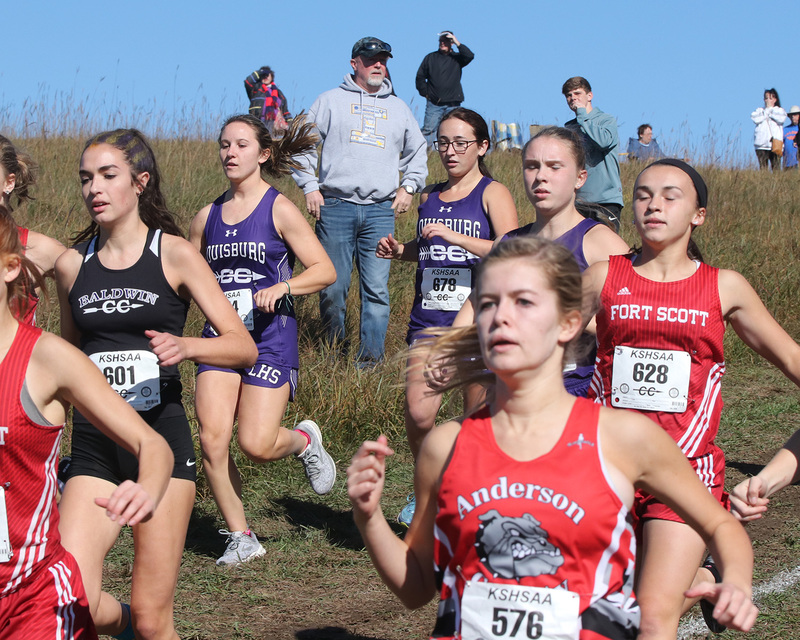 Paola’s Darian Hudgeons was first in 19:42 and it was Paola that won the team title with 46 points, while Fort Scott was third, just one point behind Louisburg. Johnson, a freshman, improved on her season best time to run a 20:25 to take fifth and Gassman also set a new personal-best time of 21:02 to take seventh. Wright (22:23) and Whitham (22:45) also had personal best times as they finished 22nd and 23rd, respectively, while Lewer (23:36) was 30th. Freshman Delaney Wright leads a pack of runners around a turn Thursday at Lewis-Young Park. “The girls performance was solid,” Louisburg coach John Reece said. “I thought Trinity ran a great race and I think she did everything she could to finish first. Reese improved again on her time and I think Carlee ran fantastic. 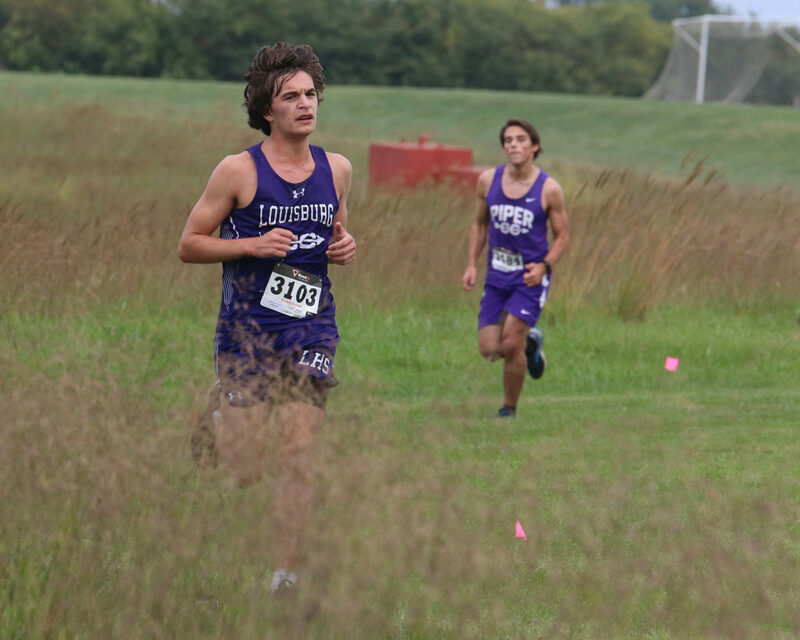 Davis and Murphy led the Louisburg boys as both earned medals. Davis finished 11th in 18 minutes and 49 seconds and Murphy was 14th in 19:05. 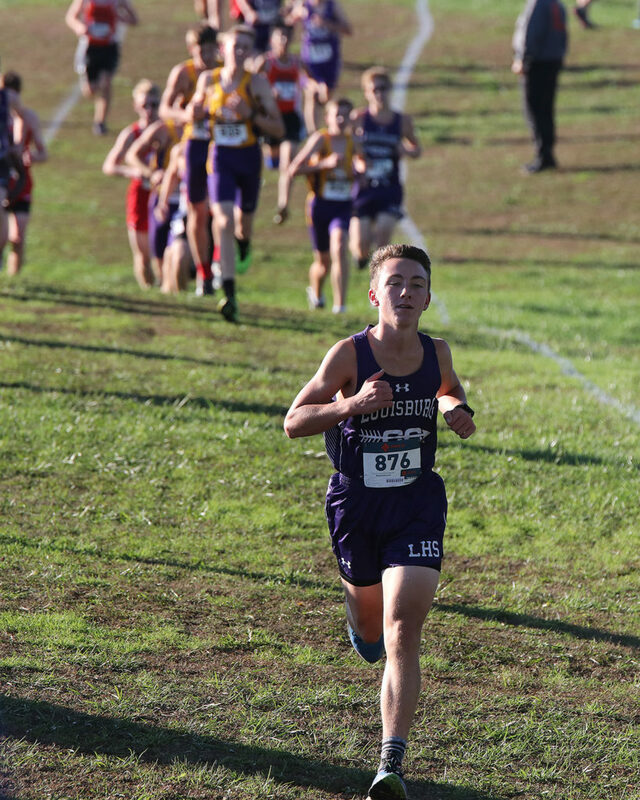 Sophomore Cade Holtzen was nearly the third Wildcat boy to medal, but was edged out at the finish line by Spring Hill’s Chase Rooney in less than a half of a second and took 16th in 19:06.04. 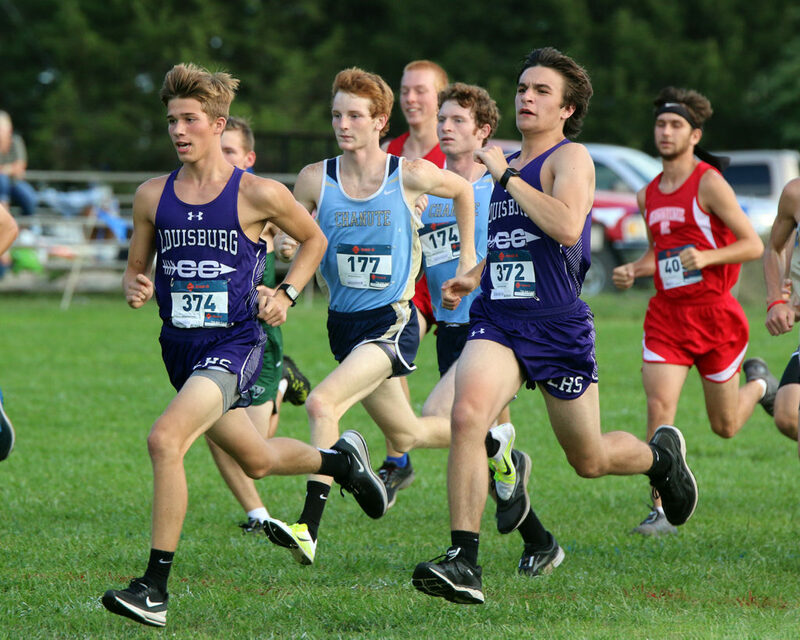 Junior Anthony Davis was one of two Wildcat boys to earn a medal during the Louisburg Invitational. Sophomore Carson Houchen finished 20th overall in 19:49 and freshman Ben McKain was 23rd in 20:11. Seniors Jackson Staab (21:32) and Gareth Baus (21:53) rounded out the Wildcat team in 30th and 32nd, respectively. Spring Hill’s Braxton Dixon won the meet with a time of 17:32 and the Broncos also won the team title with 22 points. 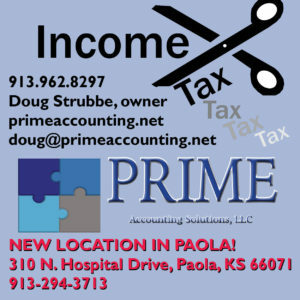 Paola was second with 57, Fort Scott was third with 82 and Louisburg was fourth at 84. 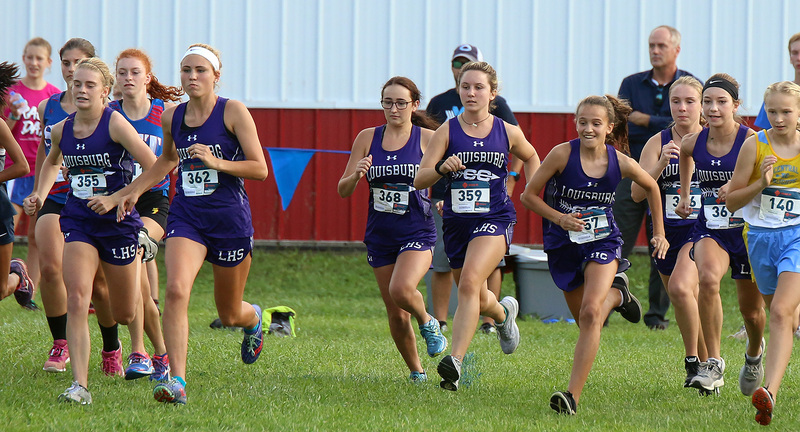 In the junior varsity races, the Louisburg girls picked up four medals on the day. Kennady Wilkerson finished fourth to lead the Lady Cats, while Alexis French, Malee Rutherford and Ruth Minster also medaled seventh, ninth and 10th, respectively. The regular season is now over for Louisburg as it focuses on the league meet this Thursday in Baldwin and then will travel to Ottawa for the regional meet on Oct. 20. 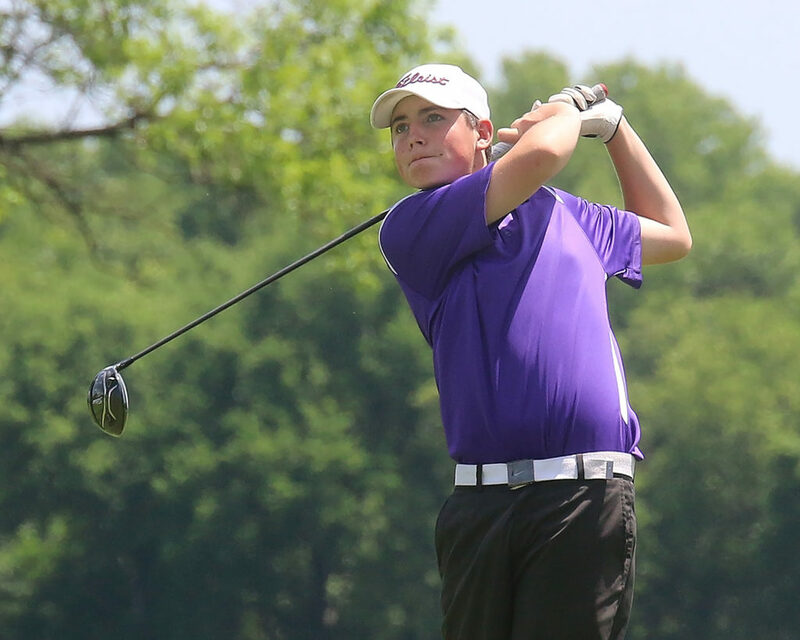 Louisburg sophomore Carson Houchen recorded a top 20 finish Thursday. “Baldwin is a great course because you can run fast there,” Reese said. 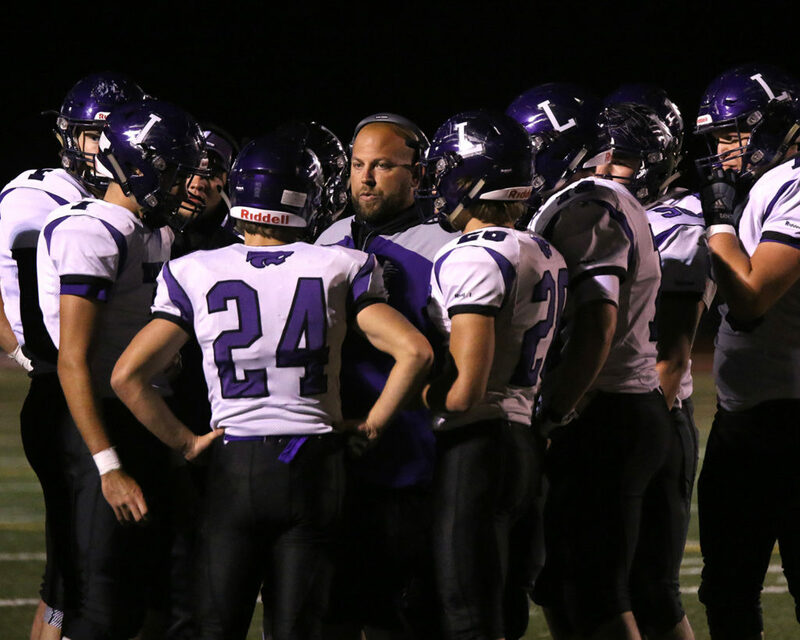 “It is a challenging course because there are rollers, but it is going to give us another chance to run against Paola and run against Baldwin and see how we stack up. 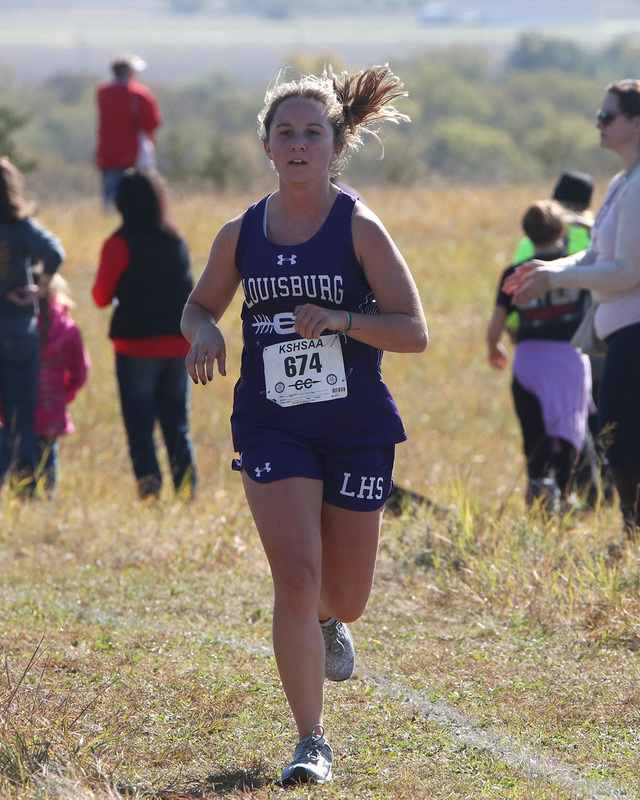 Louisburg junior Carlee Gassman was one of several runners who helped the Lady Cat cross country team to a third-place finish at the Pittsburg Invitational. 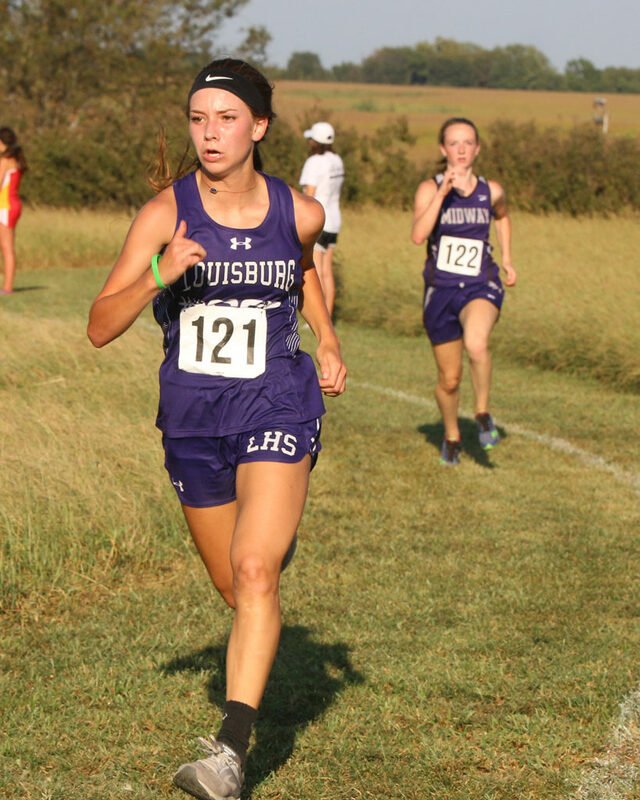 PITTSBURG – The Louisburg High School girls cross country team made it 3-for-3 in team medals following its performance Thursday at the Pittsburg Invitational. 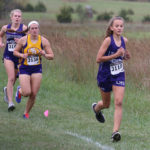 The Lady Cats earned a top three finish for the third time this season as they took third overall with 86 points, just six points behind runner-up Paola. Carl Junction (Mo.) won the meet with 40 points. Louisburg continued its improvement at Four Oaks Golf Course in just its third meet of the season. The Lady Cats medaled two individual runners as junior Trinity Moore and freshman Reese Johnson shaved time off their season best. Moore medaled sixth overall with a time of 19 minutes and 54 seconds as she medaled in the top 10 for the third time this year. 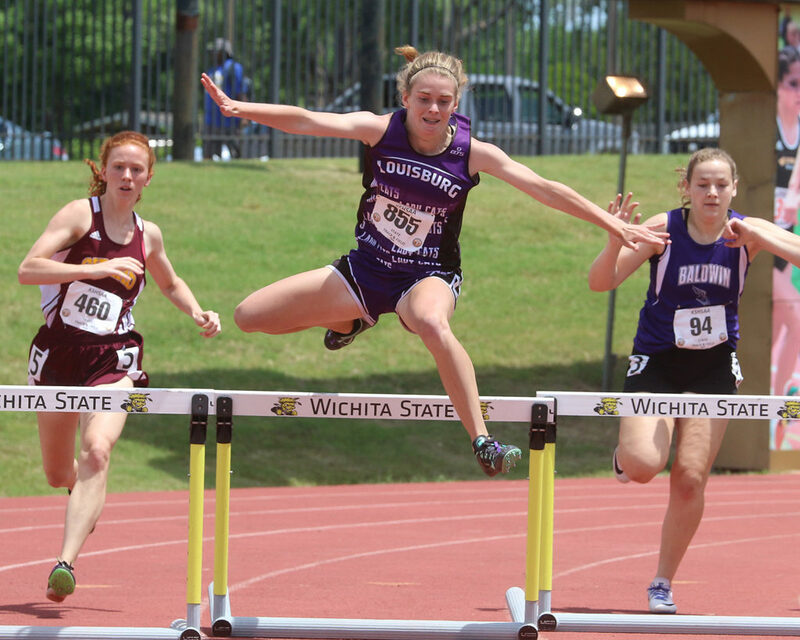 Johnson also made her way up the top times in Louisburg High School history. The Louisburg freshman finished in 19:56, which was good for eighth overall and moved her to No. 2 all-time on the LHS leaderboard. Junior Carlee Gassman finished in the top 20, just a few spots out of a medal. Gassman finished in 19th with a time of 21:11 and freshman teammate Delaney Wright was 28th in 21:53. Senior Shaylor Whitham was 30th in 22:11, while junior Emily Williams (23:32) and senior Kaitlyn Lewer (23:58) took 43rd and 48th, respectively, out of 77 runners. On the boys side, junior Anthony Davis led the Wildcat runners with a time of 18:35 to finish 28th overall. Junior Evan Murphy was second on the team in 18:48 to take 35th and sophomore Cade Holtzen was right behind him in 37th with a time of 18:51. Sophomore Carson Houchen (19:48) took 61st and freshman Ben McKain (20:25) was 74th. Seniors Gareth Baus (20:38) and Jackson Staab (22:36) rounded out the Wildcat team in 82nd and 98th, respectively. “The boys made great gains both individually and as a team,” Reece said. “Anthony, Cade and Evan have been working great together and they race well together which showed at Pitt. 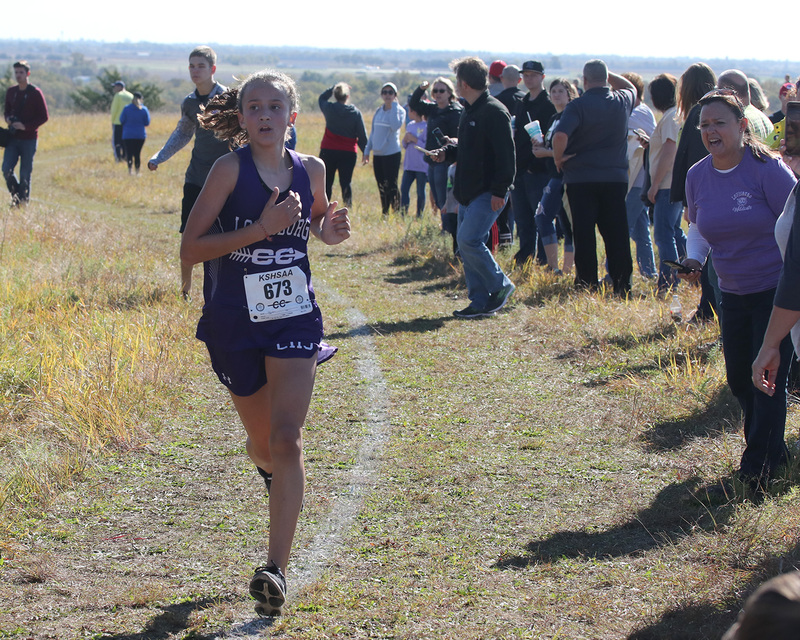 In the junior varsity girls race, sophomore Kennady Wilkerson finished sixth in 24:14 to lead Louisburg. The Wildcats are back in action this Thursday when it hosts the Louisburg Invitational at Lewis-Young Park. The meet is set to begin at 4 p.m.
Members of the Louisburg girls cross country team are (from left) Ruth Minster, JV winner Kennady Wilkerson, Trinity Moore, Delaney Wright, Reese Johnson, Emily Williams, Kaitlyn Lewer and Shaylor Whitham. The Lady Cats won the team title Thursday at Prairie View. 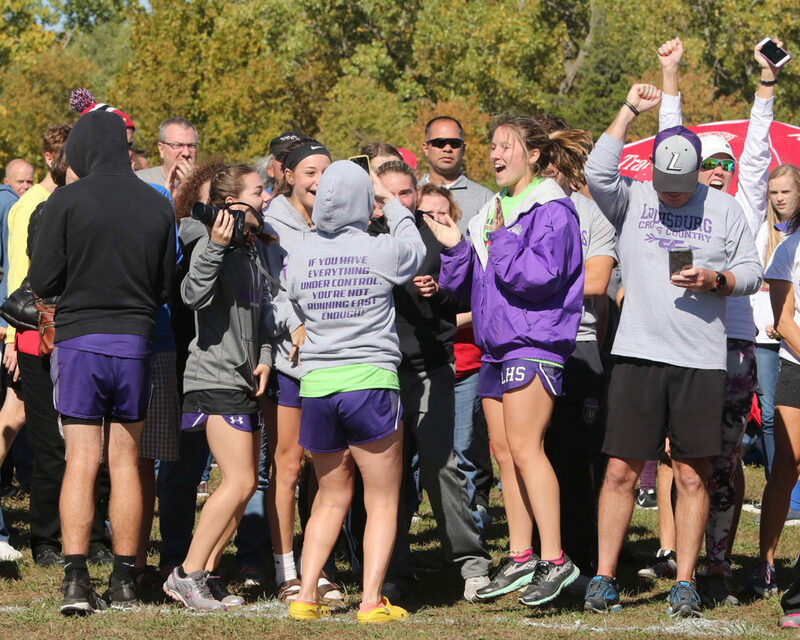 It didn’t come as a complete shock to Louisburg cross country coach John Reece when it was announced that his girls team had won the Ramsey Invitational title. Actually, he would have been shocked if the announcement had been anything but the top spot. The Lady Cats tallied 32 points and finished four points ahead of runner-up Anderson County to win the Prairie View High School meet for the fourth consecutive season. Trinity Moore, Reese Johnson, Delaney Wright, Shaylor Whitham, Kaitlyn Lewer, Emily Williams and Ruth Minster all ran the Lady Cats to a gold medal finish. Although this was nothing new for several of the runners, it didn’t mean they were any less excited about it. Not only did the Lady Cats earn top honors, but Moore took first individually in what was a photo finish. Trinity Moore (right) battles Central Heights’ Lily Meyer right to the finish line Thursday at Prairie View. Moore ran side by side with Central Heights freshman Lily Meyer for the final 50 meters of the race and it was too close to call at the finish line. When the results came out, Moore won by two-hundreths of a second with a time of 20 minutes and 50.08 seconds. That result also didn’t surprise Reece as he knows the type of runner Moore is and the type of race she is capable of running. Along with Moore, two other Lady Cats also brought home individual medals. For the second straight week, freshman Reese Johnson won a varsity medal as she took fourth overall in 21:44. 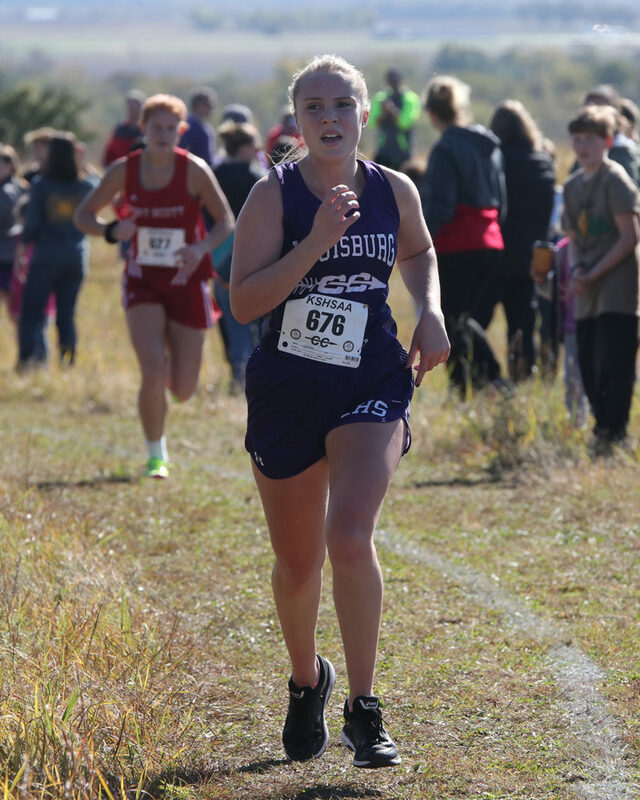 Freshman Delaney Wright finished 10th overall for Louisburg and earned her first medal. Another freshman, Delaney Wright, captured her first varsity medal in 23:56 to take 10th overall. Senior Shaylor Whitham missed a medal by one spot as she took 16th in 25:04. Senior Kaitlyn Lewer and junior Emily Williams took 18th and 19th in 25:16 and 26:05, respectively. Freshman Ruth Minster was 28th in 29:40. The Louisburg boys also fared well at Prairie View and had two runners earn medals. Junior Anthony Davis finished 13th overall to earn a varsity medal in 19:47 and sophomore Cade Holtzen was 15th with a time of 19:57. As a team, the Wildcats were fourth overall with 88 points and missed out on team medals by four points. 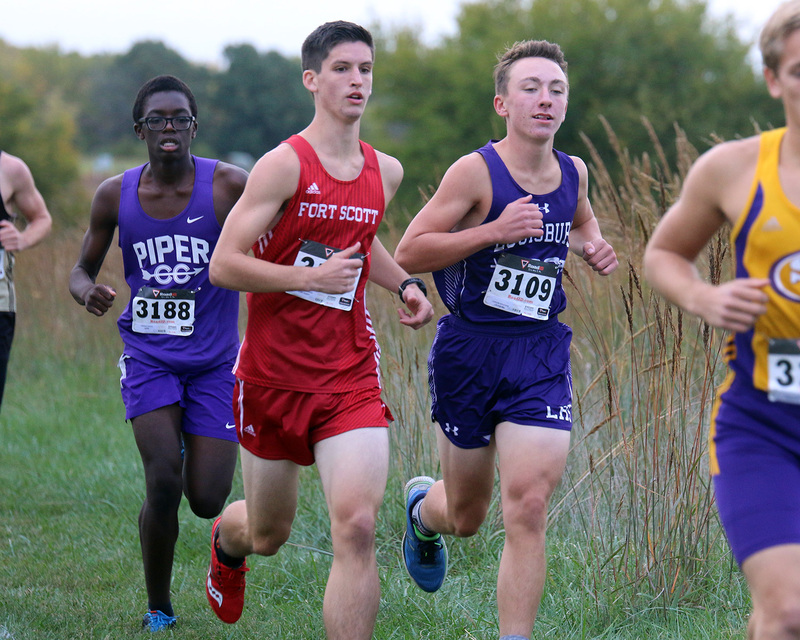 Louisburg’s Evan Murphy (left) and Ben McKain lead a pack of runners during Thursday’s meet at Prairie View High School. Junior Evan Murphy was third on the team with a time of 20:45 to finish 21st overall and sophomore Carson Houchen was 23rd in 20:54. Freshman Ben McKain took 25th in 21:08 and sophomore Tyler Detherage ran a 26:10 and came in 35th. Thanks to some inclement weather, this was only the second race of the season for Louisburg as it had two cancelled to start the year. Still, Reece believe his team is right on track to where it needs to be. On the junior varsity side, Louisburg also came away with medals on the girls side. Sophomore Kennady Wilkerson won the junior varsity girls race in 26:15 to earn top honors. Sophomore Alexis French was fifth in 27:32, junior Natalie George was seventh in 27:49 and senior Molly Rison was 10th in 28:33. Louisburg runners (from left) Trinity Moore, Carlee Gassman and Reese Johnson all earned individual medals Thursday during the Wellsville Invitational. The Lady Cats also earned team medals as they finished third overall. 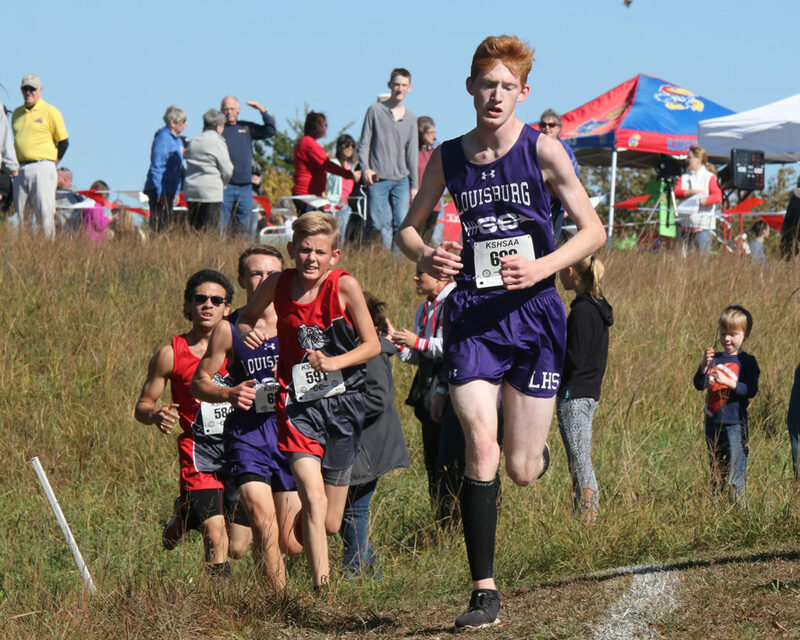 WELLSVILLE – The wait is finally over, and for the Louisburg High School cross country team, it couldn’t have come soon enough. 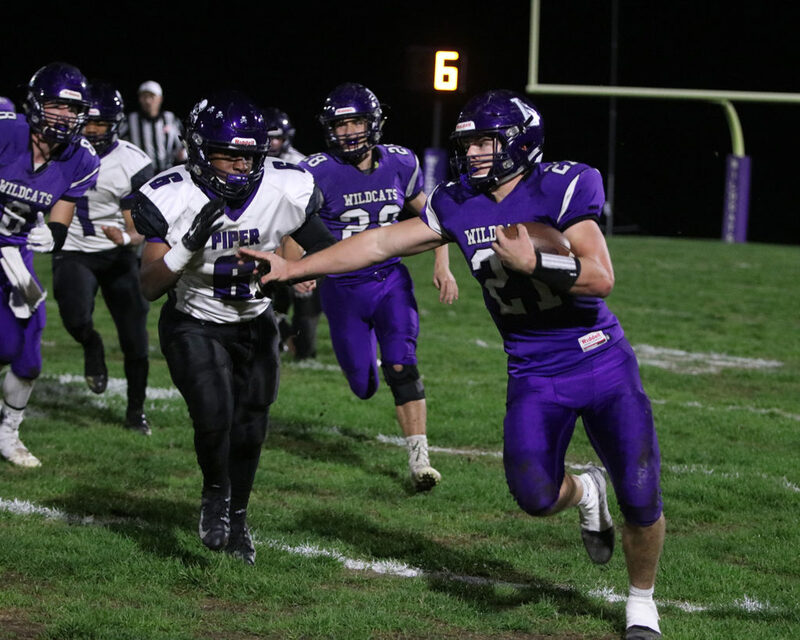 Mother Nature dampened the start of the Wildcats’ season as two meets were cancelled to begin the year and delayed their 2018 campaign by two weeks. Despite that, Louisburg was more than ready to run Thursday at the Wellsville Invitational – especially on the girls side. The Lady Cats earned team medals in their first time out as they finished third overall with 67 points and edged out Fort Scott by a point. West Franklin won the meet with 49 points and Spring Hill was second with 51. Trinity Moore, Reese Johnson, Carlee Gassman, Delaney Wright, Shaylor Whitham, Emily Williams and Kaitlyn Lewer were all a part of the third-place finish. Moore, who finished fifth at the state meet last season, ran a strong opening race as she took second with a time of 21 minutes and 26 seconds. 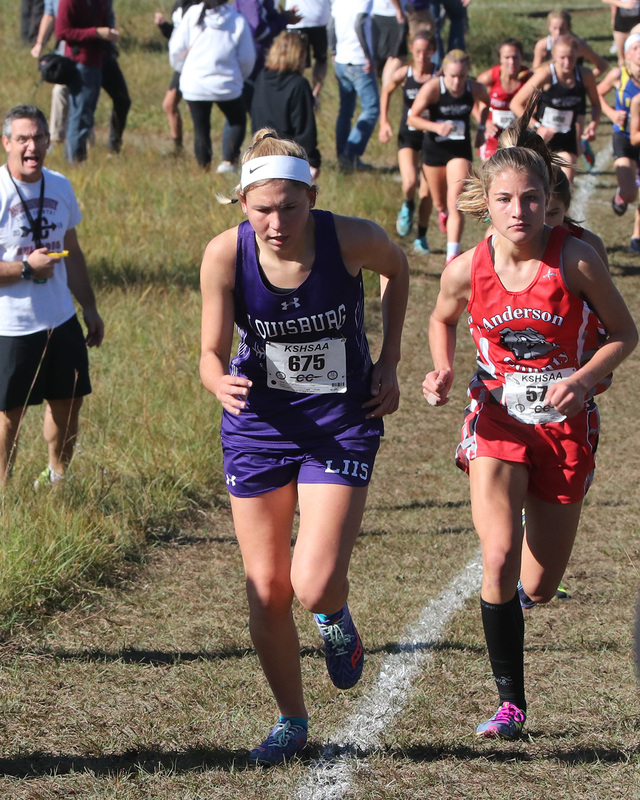 The Louisburg junior led for much of the back end of the race before being overtaken by Fort Scott’s Gabbie Clements. Johnson, a freshman, didn’t let the big stage of her first high school race bother her as she took sixth overall in a time of 22:02 to earn her first varsity medal. It was also the fourth fastest time in program history. Junior Carlee Gassman also earned an individual medal for the Lady Cats as she took 14th in 22:46. (From left) Carlee Gassman, Trinity Moore, Emily Williams, Kaitlyn Lewer, Reese Johnson, Shaylor Whitham and Delaney Wright get off to a good start Thursday in the Wellsville Invitational. 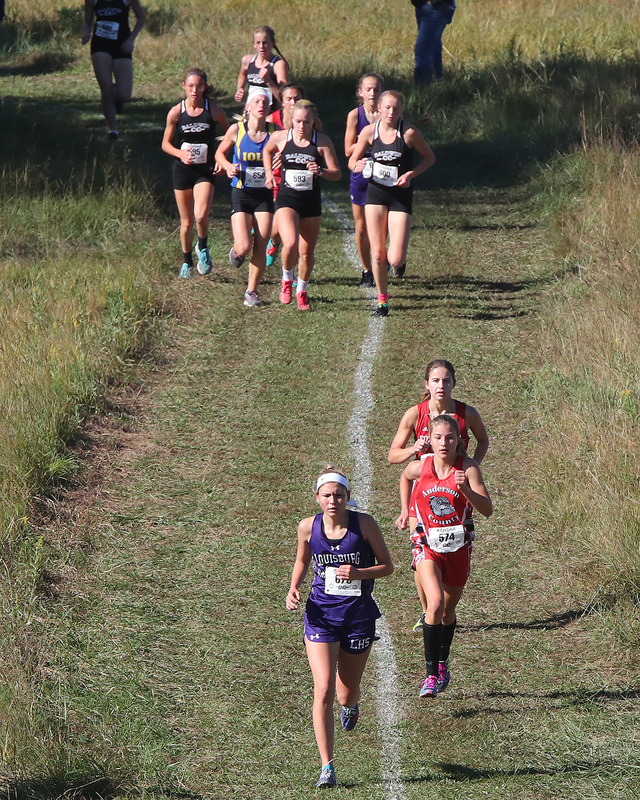 It wasn’t the typical start for Louisburg as it normally begins the season on a course that features several difficult hills, but the Wellsville course was a little different and presented some different obstacles. On the boys side, sophomore Cade Holtzen led the group of Wildcat runners in 37th with a time of 20:19. Junior Evan Murphy was next in 57th with a time of 21:06. Junior Anthony Davis (21:12) and sophomore Carson Houchen (21:16) finished 59th and 60th, respectively. Seniors Jackson Staab (24:09) and Gareth Baus (24:15) took 73rd and 74th. 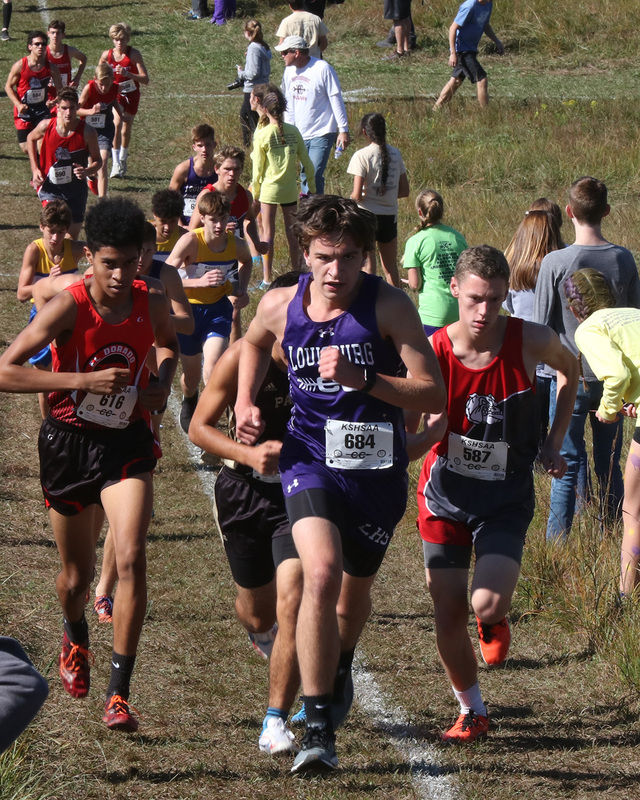 Louisburg’s Cade Holtzen (left) and Anthony Davis race toward at the front of the pack at the start of the race Thursday in Wellsville. Louisburg also picked up a pair of medals in the junior varsity races. Freshmen Ben McKain and Ruth Minster each earned a medal for their top 15 finish in their respective races. In the boys competition, McKain took seventh overall in 21:06 and Minster was 15th overall on the girls side in 26:41. The Wildcat runners return to action Thursday when it travels to the Prairie View Invitational. 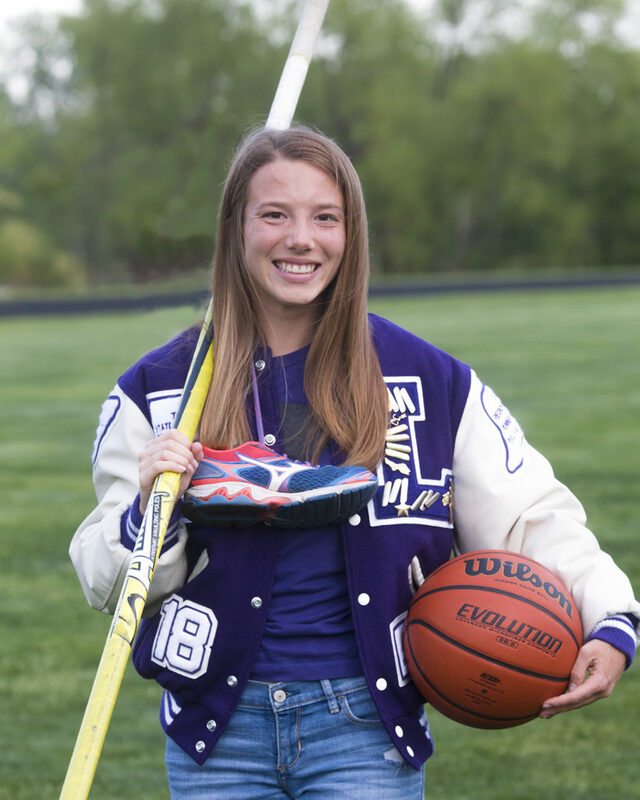 Races are set to begin at 3:30 p.m.
Louisburg junior Trinity Moore put together the best season for a female runner in Wildcat history as a sophomore as she finished fifth at the state meet and won a Frontier League title. 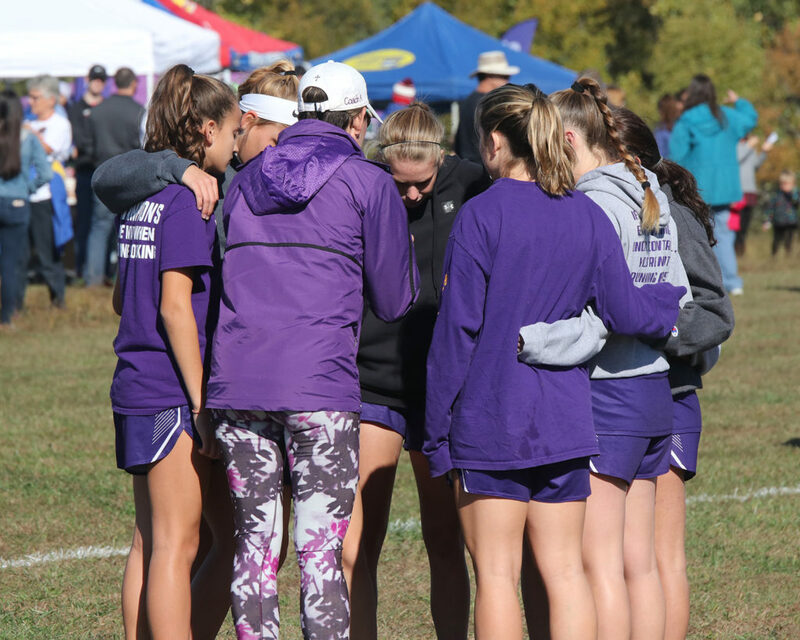 In the two decade-long history of the program, the Louisburg High School cross country team didn’t have a better season than it did in 2017. 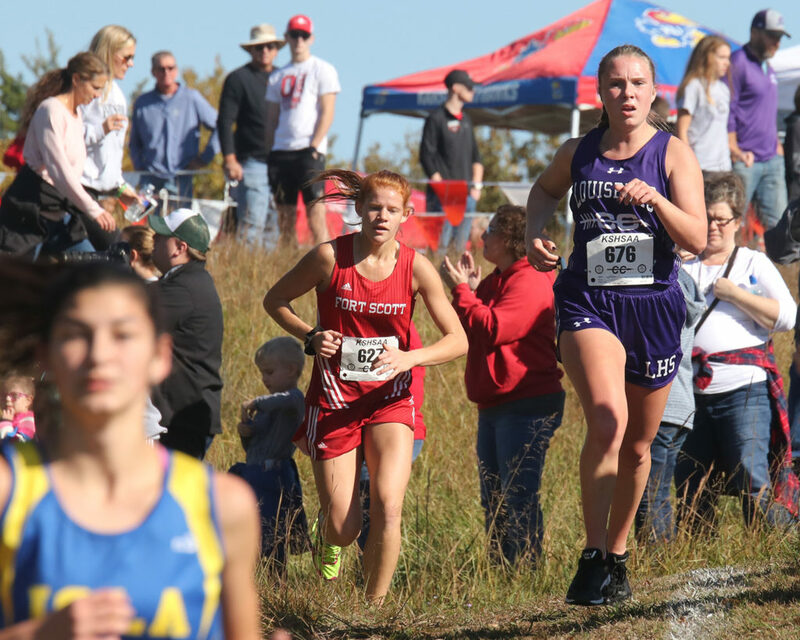 The Wildcats finished with three state medalists at the Class 4A meet in Wamego and qualified the entire girls team for state for the first time in school history. 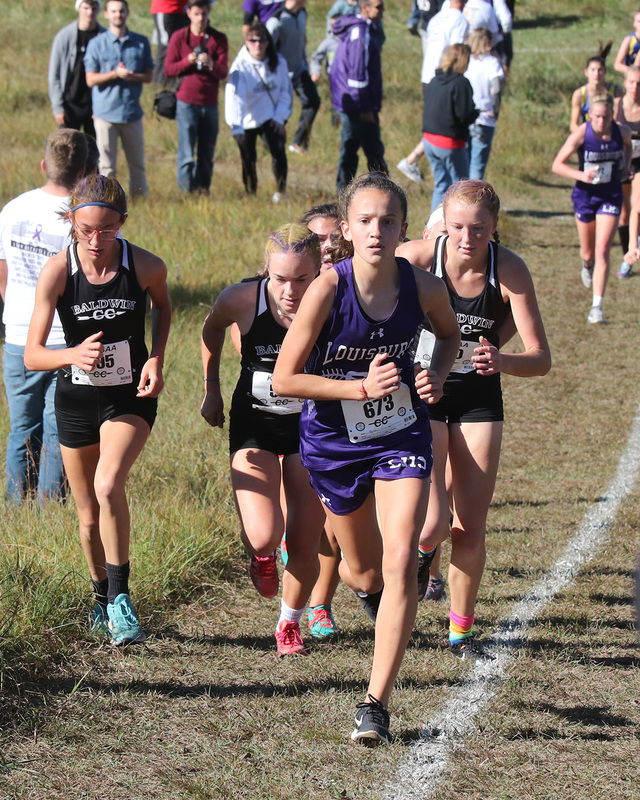 It was a season to remember for Louisburg cross country. A year later, the Wildcats are without two of their state medalists – Wyatt Reece and Tim Smith – who graduated and also saw some other members of that state qualifying girls team depart as well. Still, optimism is high for Louisburg, especially on the girls side. The Wildcats return junior Trinity Moore, who finished fifth in the state last season, and is a two-time state medalist. Louisburg also returns four members from that state qualifying team in Moore, junior Carlee Gassman, junior Emily Williams and senior Kaitlyn Lewer. The Wildcats added several freshman runners to the program who figure to work their way up as the season goes along. “Practice has been going great,” Louisburg coach John Reece said. “We are ready to get started and see how we compare to other schools. Senior Kaitlyn Lewer is one of four returning runners from last season’s state qualifying team. Moore had a strong finish to her 2017 season as she ended as a Frontier League champion, took third in the regional meet and fifth at state in 19 minutes and 47 seconds, which broke her own school record. As fun as that season was for Moore, she has even bigger expectations this year. “I really want to improve my time and break 19 minutes,” Moore said. “If I work hard and push myself in practice and meets, I know I can accomplish this. I also hope to make it to state again this year with my team. If we work and race our best every week, I think we will be able to make it to state and exceed what we did last year. As a whole, the Wildcats have 26 runners out this season, most of which are on the girls side. The boys lost their two top runners in Wyatt Reece and Smith, but return junior Evan Murphy, and sophomores Cade Holtzen and Carson Houchen, who logged a lot of varsity miles last season and progressed as the year went along. “The boys side will be a little different than last year,” coach Reece said. “We will still look to improve as individuals, but as far as a team, it will be a lot like last year and we might not field a full team until later in the season. Louisburg will get its season started Thursday when it travels to the Anderson County Invitational at the Garnett Golf Course. The first race is scheduled to begin at 3:30, with the varsity not slated to begin until close to 6 p.m.